So now, as I’m meal planning each week, we pretty much have some sort of pasta dish every week. It’s easy, versatile, and delicious. We’ve been experimenting with different types of sauces and meats, shapes of pasta, and pasta ingredients. Sometimes we have whole wheat pasta, other times white pasta from Italy, and others, Banza pasta. 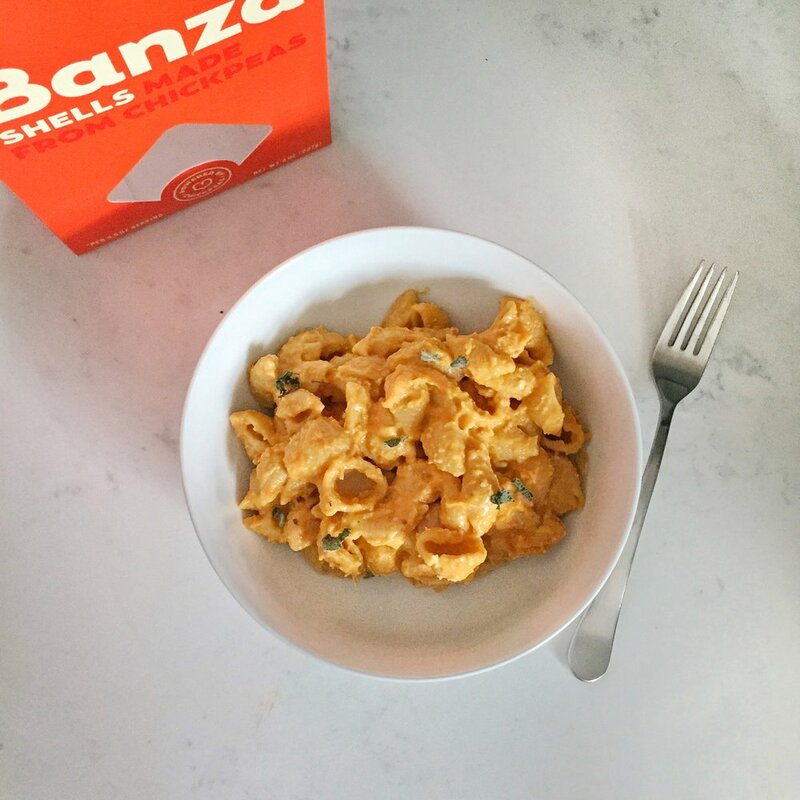 Banza pasta is made from chickpeas, so it’s naturally gluten free. I’ve tried a few gluten free pastas in my days, and they are NOT all created equal. 😳Although Banza’s pasta has a different texture than regular flour pasta, Isaac and I really like it! It’s nice and hearty and holds up well, unlike other mushy GF pastas. I also like that it adds variety to my food intake. We don’t eat a ton of beans, so this easily adds another food group into our weekly intake. And because it’s made with chickpeas, I don’t have to plan a meat in order for it to have protein. Because if you follow me, you know I’m all about having protein, carbs, fat, and fiber at my meals (yay for satisfaction and satiety). It also makes throwing together a quick meal easy when I don’t have a plan for dinner and don’t want to go get additional ingredients. Banza thinks that most new years resolutions (which I don’t personally do) are too serious, too stressful, and too hard to stick to. And I completely agree. They also think that in order to enhance your health and life, you don’t have to make life worse. I’m gonna argue that if your new “health” behavior is making life more stressful and less enjoyable, then it probably isn’t actually healthy. As a result, their current campaign is #ResolveToEatMorePasta and that is a resolution I can get behind 🤓. You can technically make this recipe with any pasta you prefer. And serve it with a meat of choice, if you like. We ate this one night with pre-cooked chicken sausage for more flavor and texture. Prep your veggies and bacon (the bacon is key for giving it a savory, smokey flavor 😍) and roast them until fork tender. 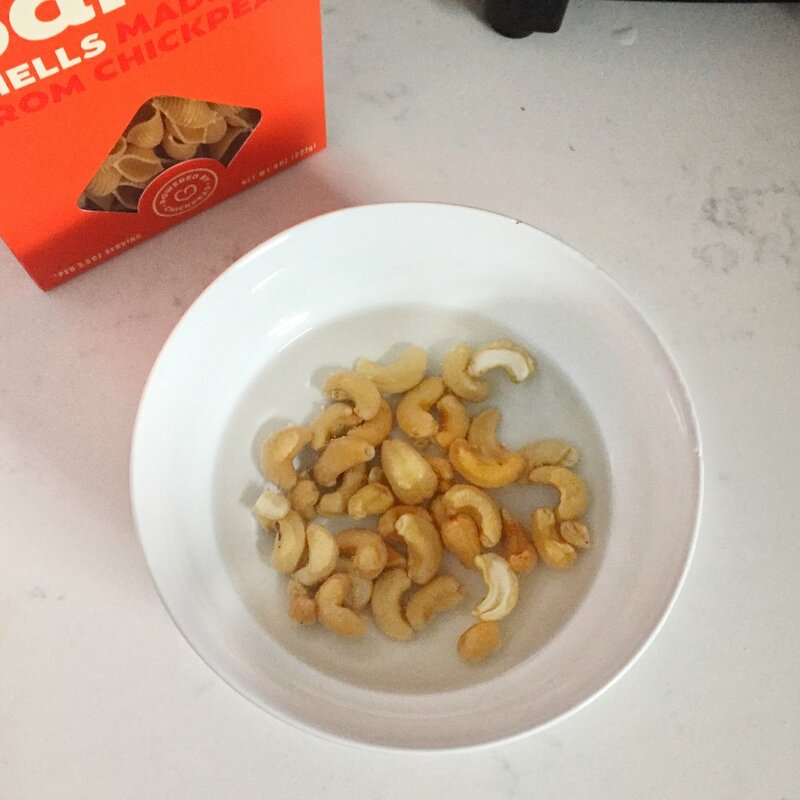 Meanwhile, soak your cashews in water and boil your pasta. Once the veggies are done, puree them with the softened cashews, nutritional yeast (or cream cheese, if you prefer! ), and enough chicken broth to create a smooth sauce. Mix with your cooked and drained pasta, and viola! You’ve got a delicious lunch or dinner that is packed full of nutrition and flavor. I’d love to hear what you think of it when you try it!